Eileen De los Reyes Nath is a Registered Nurse and Family Nurse Practitioner who brings over 15 years experience in medical aesthetics. 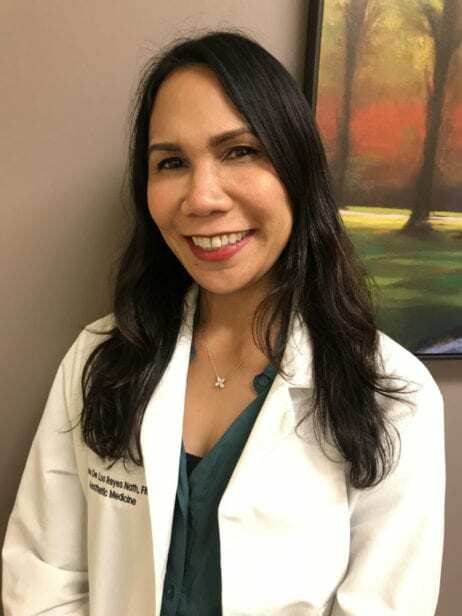 Eileen is an expert injector who started her clinical career at a distinguished internal medicine practice in West Los Angeles after receiving her Master’s Degree from the University of California, Los Angeles. She then moved on to work for prestigious plastic surgery group in Huntington Beach, where she continued to hone her skills and training in neuromodulators, dermal fillers and various laser procedures and worked as part of the breast cancer reconstruction team. After moving to Northern California, she worked in San Francisco with a world-recognized cosmetic dermatologist in San Francisco. For the last five years, Eileen has worked for a local medical spa and skincare clinic that ranks in the top 1% of facial injectors in the country's well as a multimodality, patient centered practice. She is eager to bring her expertise and advanced skill set collaborating with Dr. Haena Kim in partnering with patients to achieve the safest and most natural looking results. Eileen is happily married with 3 children and enjoys spending time with family and friends, barre exercise classes and beachside vacations. For more information about facial plastic and reconstructive surgery in the Walnut Creek and San Francisco Bay Area contact us at (925) 891-4135 or info@drhaenakim.com.